Feb 2009, New Delhi: Dr Zafarul Islam Khan, president of All India Muslim Majlis-e Mushawarat, the umbrella body of Indian Muslim organizations, while responding to a Hindu outfit’s three-point demand from Muslim leadership to clarify about India’s Islamic status, Hindus being called kafirs and Jihad, said that India is not Darul Harb. “India is a Darul Aman or Darul Salam, i.e., an abode of peace where Muslims are bound by their religion, morality, covenant, and our Constitution to live in peace with all other inhabitants of their homeland,” Dr Khan said. The Dharma Raksha Manch, a self-styled forum which claims to speak on behalf of Hindus, earlier this week issued a statement in New Delhi demanding leading Muslim organizations and institutions to come clean on its three points. The Hindu group had asked Muslims to declare that Hindus are not kafirs. Responding to this point, Dr Khan said: the Arabic term "kafir" means one who does not believe in Islam and as such all non-Muslims are kafirs in the same way as all Muslims are kafirs, i.e, non-believers in other religions like Hinduism etc. Giving his view about the concept of Jihad, Dr Khan, a noted Islamic scholar and Editor of fortnightly Milli Gazette said: Only an Islamic or Muslim state/ruler can wage Jihad which is synonymous to defence in our modern jargon. Jihad can be waged only against a foreign country or foreign community or group which is actively engaged in aggression against a Muslim state or community. There is no way that private Muslim groups or individuals can wage jihad. If anyone is doing this, it is illegal and illegitimate whether it takes place in India or outside India. On Jihad vis-à-vis kafirs he said: There is no Islamic rule whatsoever that Jihad should be waged against "Kafirs / non-believers". This is a misleading propaganda spread by the enemies of Islam and Muslims and lapped up by some in our country. While making the concept of Jihad further clear, Dr Khan said: Ordinary Muslims and groups are allowed to wage Jihad in a country which is occupied by a foreign power. But in the case of foreign occupation, individuals under occupation can resort to defend their country if there is no organised group fighting against the occupation forces. This right is called “resistance” in the international law today. Indian Muslims did this duty in the past when our country was occupied and will do the same if, God forbid, our country falls under foreign occupation in future. The Hindu group has also demanded Muslim organizations including All India Muslim Majlis-e Mushawarat, Jamaat-e-Islami Hind and All India Milli Council and institutions including Darul Uloom Deoband and Nadwatul Ulema to issue fatwa against terrorism. Responding to the demand, Dr Khan said: “As the current head of one of the Muslim organisations (All India Muslim Majlis-e Mushawarat) specifically asked in this document to make certain clarifications, I would like to state that Indian Muslim organisations and institutions of all hue and colour have clearly denounced terrorism in all its shapes and forms and have held umpteen conferences and meetings across the country to popularise this message among the masses. He, however, asked why Hindu leaders and organizations are silent on terrorism even after the disclosure of involvement of some Hindu extremists individual and groups in terror activities in the country. 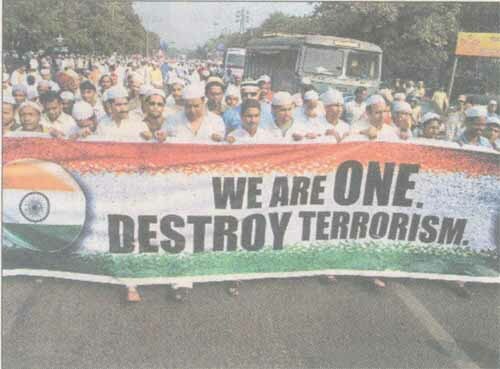 Have Hindu organisations and institutions too denounced terrorism perpetrated by people masquerading as Hindus or claiming to work for the Hindu cause, ranging from political outfits resorting to terrorism to a plethora of organisations dedicated to terrorism. Some members of such Hindu terror organisation including a serving officer of the Indian army are now under police custody with ample proof that they committed specific terrorist acts while trying hard to blame Muslims for the same. We have not heard a single Hindu organisation and leader denouncing these terrorists and their known organisations and supporters. Instead many have come forward to support them and offer them monetary and legal help. Until and unless Hindu organisations openly and unequivocally denounce Hindu terrorism in all forms they have no moral right to preach others. Acknowledgements: Information in this page taken from www.twocircles.net website.